Experiments at DESY's X-ray source PETRA III have revealed the first structure of a biological transporter protein loaded with a pro-drug. Prodrugs are inactive medications that are metabolized into an active, functional form within the body. They can hijack the human nutrient transporter proteins PepT1 or PepT2 that are located in the cell membrane and usually channel peptides derived from digested food into cells. This way, pro-drugs can hitch a ride directly into the cell, accelerating the drug's absorption. While the pro-drug concept is very effective, little is known at the molecular level about the peptide transporters' structure and how they recognize, bind and transport pro-drugs. The groups of Christian Loew and Jan Kosinski from the European Molecular Biology Laboratory (EMBL) working at the Centre for Structural Systems Biology (CSSB) on DESY campus in Hamburg are now a step closer to understanding this. 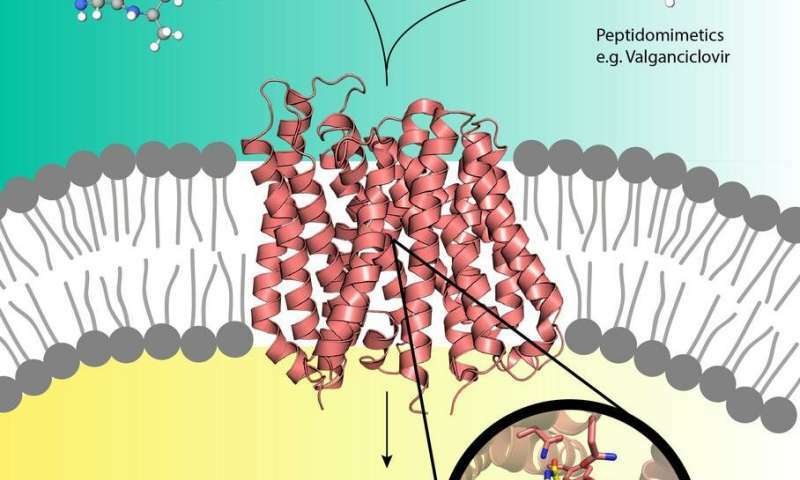 The scientists determined the first high resolution crystal structure of a peptide transporter in complex with the pharmacological relevant pro-drug valganciclovir; a medication that combats certain viral infections. Their results, published in the Journal of the American Chemical Society, could assist in the design of pro-drugs with improved absorption rates. CSSB is a co-operation of ten scientific institutions including DESY. The bacterial peptide transporter DtpA from Escherichia coli is a close homologue of the human PepT1 transporter and was therefore chosen by the scientists as a prototype. The spatial structure of a biomolecule can be determined by growing tiny crystals from many of the same biomolecules and illuminating them with X-ray. The crystals diffract the X-rays in a way that is related to their inner structure. This means, from the diffraction pattern, the inner structure of the crystal can be calculated, revealing the atomic structure of its constituents, the biomolecules. Growing sufficiently high-quality crystals from biomolecules can be very challenging. To produce well-diffracting crystals of DtpA, Loew teamed up with the group of Jan Steyaert from the Vrije Universiteit in Brussels to generate DtpA specific nanobodies. Nanobodies are specific single-domain antibody fragments. "They increase the stability of membranes proteins such as DtpA thus allowing us to generate high quality crystals," explains Loew. The Loew group then carried out the crystallisation experiments of DtpA in complex with a nanobody and a pro-drug molecule at the Sample Preparation and Characterization facility (SPC) and analysed the obtained crystals at the beamlines P13 and P14 which are part of DESY's X-ray light source PETRA III and operated by t EMBL. The scientists were able to determine a 2.65 Ångstrom (0.265 nano meter) resolution structure of DtpA bound with the pro-drug valganciclovir that revealed an unexpected binding mode. "The orientation of the pro-drug in the binding pocket is flipped by 180 degrees relative to prior predictions," explains Loew. "We also discovered that DtpA preferably binds and likely transports tripeptides over dipeptides." The Kosinski group built a high-quality structural model of the human PepT1 transporter in complex with valganciclovir using the DtpA crystal structure as a guide. "The model shows that human PepT1 very likely binds the drug in the same way as DtpA and pinpoints the exact amino acid groups responsible for binding," clarifies Kosinski. Therefore, the insights generated by this model of PepT1 may facilitate development of new pro-drugs with improved absorption rates. Such improvements would not only lower the pharmacologically effective dose but could also reduce the negative side effects experienced by patients.